It’s the weekend of Thanksgiving here in Canada, a good opportunity to carve out some time to get out and do a little street shooting. “Free-form”. Meaning I hit the streets with no preconceived ideas or destination in mind. I’ll leave much of the weekend up to chance, and see where the wind takes me. It is a beautiful weekend in The Golden Horseshoe. The sun is shining, the skies clear and the temperatures have been tremendous for this time of year. The leaves are changing colours, even a bit early I think, so I may find myself venturing off into the trails of the Niagara Escarpment to make some nature photography before it’s too late. This is something I very much like about Hamilton and the surrounding area. One minute you may find yourself hiking the woods, or walking the waterfront, and the next you’re wandering the inner city following the light. It really does have a bit of everything. Right now the city parks and streets are collecting new fallen leaves. The breezes are ruffling them in circles around my feet. I love that sound of crispy leaves swirling on pavement. There is a chill in the air, a light jacket is required. We're expecting frost this Thanksgiving. Have you noticed how quickly the sun is changing these days? The autumn season seems to be moving along at a rapid clip. So it seems. Starting out earlier in the day is something I’m having to now consider in my plans. I will hit one of my favourite stretches along James Street North and South. I’ve been “working” this street for many years now. 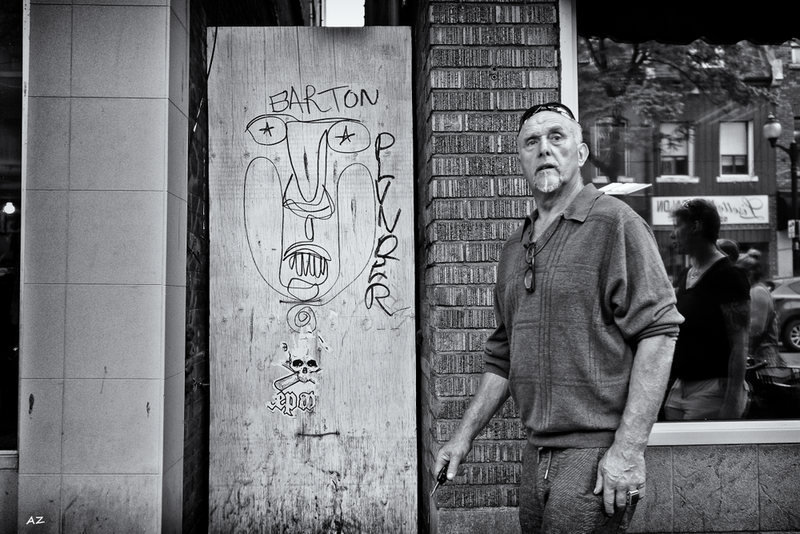 I may also shoot a few pictures over on Locke Street. There are always plenty of people walking these little gentrified neighborhoods with their stretches of antique stores, specialty shops, galleries and cafes. I’m sure to find something inspiring to photograph. One of the questions I get often is “Do you usually have a plan or an idea in mind before you go out to shoot in the streets?”. I do have a tendency to go from personal photo project to project, a few remain incomplete, while a couple do continue to evolve in interesting ways. I am currently working on photography projects that are long term and I pick up on them as the mood and opportunity strike. One is not specific to street photography, although I do cross genre using a contemplative "Miksang" like approach. So many starts and stops. Then there is my ongoing mixed media visual documentary on city alleyways. Another photo project is on urban art and graffiti. Then I have side projects of musicians and performance. I am eager to share some of these with you in due time. For the most part I am simply in search of the special one-off moments that are often overlooked in the ordinary and the mundane of daily city life. In search of the creative possibilities digging deep into ones self, relying on intuition, readiness and skill. Getting a high when all the right elements come together. It's like a drug some days. Chasing the elusive one-frame story. Can you really tell a story in just one-frame? To me that is the definition of the decisive moment, when all those elements come together at the right time. A photo that will take the viewer into their own imaginations. We all recognize a good shot when we see it. How does it speak to you? It is so hard to make a good photo let alone a great one. Many ask what I shoot with. I don’t know that this is all too important, but I understand that some find it interesting to know and talk about. For the last four years I've been shooting the streets with mirrorless micro 4/3 (compact system) cameras. These are small interchangeable lens cameras that offer a huge range of great glass options. I’m very fond of the 17mm f1.8 Olympus quite specifically. A brilliant lens in so many ways. It’s a fast prime equivalent to a 35mm on a full frame camera. A normal wide lens that is considered a very traditional focal point. This lens is very tiny. Solid. It’s made of metal, with an easy to use manual focus ring. Perfect too for zone focusing. It fits so nicely on my Olympus OM-D camera body, and makes this compact system light in the hand, and totally unobtrusive. It’s not so much about the camera, it’s how you feel when you’re using it. I’m not a gear nut by any stretch, but I have come to really like the micro 4/3 cameras. Regardless, I don’t think any manufacture today makes a bad camera. They are all good. I am defiant by nature. So when someone starts to talk about “rules” in street photography, I will purposely go out of my way to break them. There really is no one way, or better way, to shoot street. We all have our own unique styles and approaches. We all have something to learn from each other which helps us define our own styles. It’s funny how many photographer’s look down at other photographer’s "shooting from the hip". Some will insist that this isn’t pure street photography. Perhaps they are correct. I have never thought too much of it. I benefit equally from the viewfinder as much as the LCD screen. And why not? "The idiom to "Shoot from the Hip" refers to taking a quick decision in a situation without spending much time on weighing other suitable alternatives. Shooting from the hip may attribute an impulsive and rash decision." More on origin. When we talk about shooting from the hip in photography, nothing could possibly be further from the truth. Whether using a viewfinder or shooting from the hip all things must still come into consideration. Subject matter firstly. Composition, lighting, motion, emotion, juxtaposition, symmetry, geometry and patterns, choosing colour or black and white, looking for the story, assembling all the right pieces into the frame. So many considerations, none of which are exactly impulsive or rash. It's all photography, regardless how you compose the shot. "Shooting from the hip" is about expanding rather than putting limitations on the creative possibilities when shooting street photography. Many small cameras today don’t have a viewfinder. Sure, I do prefer using a camera that is equipped with a viewfinder, or at least one I can attach. I think using a viewfinder is a nicer way to compose shots generally speaking, that’s a preference. However, you can just as easily compose a great shot from the LCD screen. At times it has it’s incredible advantages. Particularly if it angles up or down, or flips out. Think about the Ricoh GR II camera, Sony RX100 series, the Fuji X70, or Olympus Pen series. Stellar cameras. All without viewfinders that are perfect for travel and street-style shooting. Any of them will produce incredible images, with the right photographer behind the LCD screen. If you are shooting from the hip, they say the idea generally is to not use the viewfinder or the screen at all. I don’t see it so black and white. Shooting from the hip doesn’t mean you’re trying to fool people either into thinking you are not photographing them. They know it. Usually they don’t care. Although you can do it with great discretion in a way that makes you more invisible. That comes with how you move among the city. Your style, how you appear, how you project and connect, even what you wear can all send a message of “being” - non threatening. And blending in. Shooting from the hip doesn’t have anything to do with “hiding” what you are doing in the street. I don’t usually recommend that photographers actually put on headphones while candidly shooting life in city streets. That’s unnecessarily risky, in my view. Particularly at night or in areas you are not familiar with. Street photography is usually solo work, and you ought to have your wits about you at all times. You need to hear cars and things coming up behind you. Needless to say. Here are a few bullet points to consider when shooting street, and shooting from the hip. Open yourself up to the unexpected. Open yourself up to new ways of seeing and shooting - from above eye level, to eye level, all the way to the ground. Always consider the background and get close to your subject. Pay attention to everything in the fame. Flash? Hmmm… I’ll leave that up to you. I don’t really like the look. It doesn’t appeal to me. I bet it doesn’t appeal to the subject either. Avoid the banal (this really goes for all street shooting). I’m not sure I want to touch on this, I’m no critic, except of my own work. Stake out a scene you like and frame it. Experiment with interesting angles. You are no longer at eye-level, look for leading lines. Look for interesting light. Focus on the scene first. Anticipate your subject entering the scene -- look for something interesting or unique about that subject. The challenge is making a picture moment that becomes immersive. Is there potential for a story? Keep out of people’s way. Be self aware and sensitive to the rhythm of the city. I would say nearly 1/3 of my street photography images have been shot from the hip, or thereabouts. Often combining both viewfinder and at the hip depending on the situation. I really like the composition and mood that can be achieved when “shooting from the hip”.﻿ One of my favourite street photographer’s is Willem Jonkers. He lives in Rotterdam, Netherlands. Willem has a series of black and white photography that are shot from the most interesting angles, usually from ground level looking straight up. They’re fantastic, immersive, and Willem puts you right inside the photo. You can find his work here. http://www.willemjonkers.com/. He may not be shooting from the hip in hard terms, but he is creative using his LCD screen..
Why shoot from the hip? What are the benefits? Again, this is about opening yourself up to new ways of seeing. It is a way of letting go. Being free and leaving much up to serendipitous moments. The more you shoot the better chances of surprises and inspiration when you are out shooting. It can offer unique opportunities to new perspectives when shooting at waist or chest level, or from the side, or down low. If done well, it can be very effective at putting the viewer inside the photo. It is a popular technique for shooting candids and a great way to staying more invisible. If part of your objective is to be less noticeable, don’t make eye contact with your subjects. Look elsewhere for a moment or just beyond them, as if you’re looking over their shoulder. If you lock eyes, smile. Acknowledge them. It’s no big deal. With your eyes up and your camera down and ready to shoot, you are able to explore the scene unencumbered by the camera in front of your face. Glancing down at the screen now and again helps you to compose the shot, but the purpose of shooting from the hip is to mainly keep your eyes forward. It takes practice. You will want to shoot a lot of photos, because your chances of a good image are fewer. A lot fewer in fact -- when you’re not looking through a viewfinder or LCD screen. I’ve gotten good enough at this technique and know my camera, the settings I choose and the lenses I attach that I’m one with them. I always know exactly where I should be pointing - where the plane is - how far or close I need to be - focusing on the creative, the entirety of the scene and not so much with the technical. Here are some things I will do ahead of time that makes the process a little easier. You won’t be looking through your viewfinder, and you don’t want to be fiddling with dials from the hip — so set your exposure ahead of time. If your lighting is changing, or if you’re moving in and out of light, you may want to put your camera into “P’ Mode and set the ISO in manual mode. I like using aperture priority mode and let the camera set the proper exposure as you go, be sure to use evaluative metering rather than spot metering. Cameras today are so smart, why not let them do more of the technical work. I am someone who is used to shooting in full manual mode, as I like to be in complete control -- but in shooting from the hip this means potentially missing shots because I’m unnecessarily looking down fiddling with dials. In the street the lighting is constantly changing. You may be moving in and out of shadows. Using Shutter or Aperture Priority modes really do offer freedoms to the street photographer. It's worth learning more about them if you're unfamiliar. I expect you know what you're doing. I like to shoot usually between f4 up to f8 during the daytime. It ups the chances of everything being in focus. It’s all about understanding depth of field and what you want to achieve. The background environment is just as important as your main subject when shooting street. Shooting from the hip means that you aren’t bringing the camera up to your eye. When you’re using two hands and the body of the camera is touching your face, that gives you extra support with less chance of camera shake. In some cases you may be shooting from the hip while on the move. In this situation a faster than normal shutter speed is the way to go — I’d suggest 1/250sec or faster. I always keep my exposure compensation on manual when in semi-auto modes and on the move. Note, of course, that between the fast shutter speed and the small aperture, you may need to boost your ISO considerably. Don’t leave your ISO on auto. For best results, experiment with ranges of 400 and 800 or higher even and let the camera do the rest. As always, this is about balancing your technical decisions with your creative ones. Don't worry about introducing grain. Grain can be beautiful. 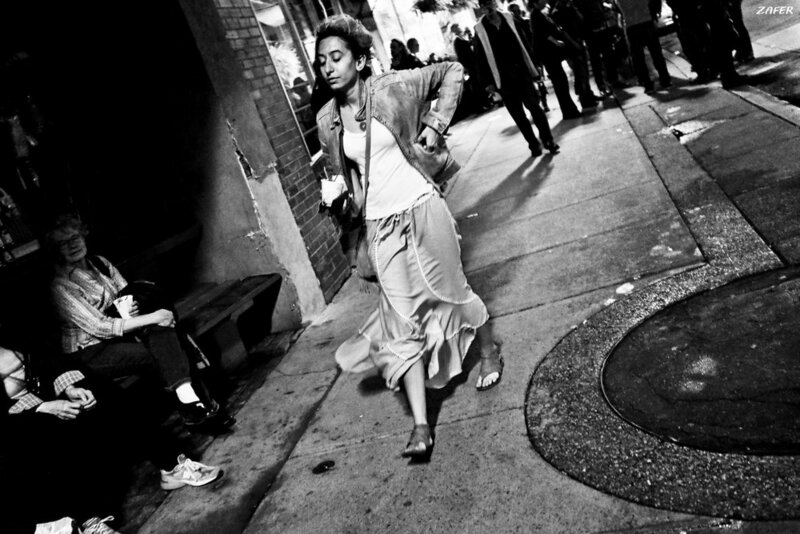 Traditionally street shots have been more gritty, and interesting. Grain is part of the art. Capturing strangers candidly while keeping everything sharp is probably the toughest technical skill to learn in street photography. Not to say motion and blur cannot be effective, it is, but for most cases we want everything to be focused correctly. For this I use the distance scale on my Olympus 17mm f1.8 lens (35mm equiv on a full-frame camera) or my 12mm-40mm f2.8 Olympus Pro zoom (equiv to a 24-80mm based on a 35mm full-frame camera). Zone focusing is excellent regardless whether or not you’re shooting from the hip. To do this well you really need to understand DOF (depth of field). Reducing the aperture size increases the depth of field of the image. I’ll stop down from F5.6 to F8 and allow for everything from about 5 feet to 15 feet away to be in focus. For fast-moving street photography, it gives me an excellent range to work with. Mind you if you are shooting in darker areas, such as subways or alleys, this will be difficult and you will want to open up your lens as wide as possible, such as f2.8. Note: If you have the time to manually focus with a viewfinder, then do it. That is much more consistently accurate than trying to guess distances and zone focusing. 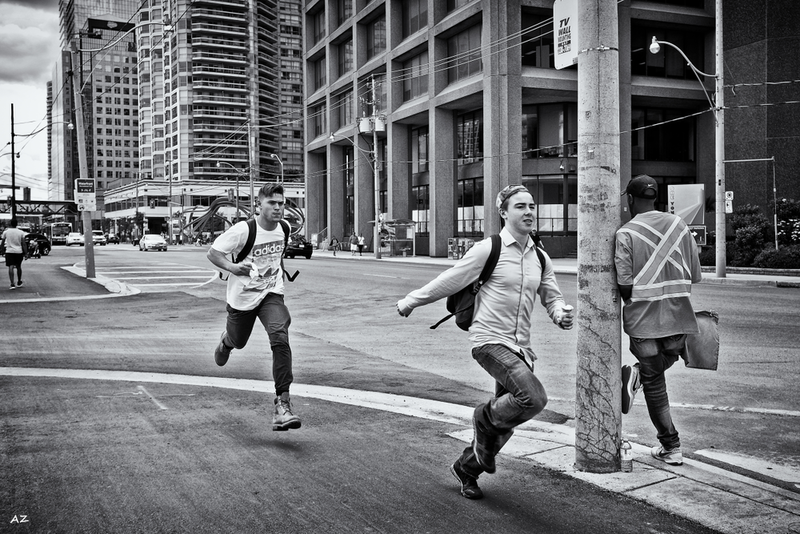 With practice you will find zone focusing to be a fantastic option for capturing the fast pace of the city streets. Simply leaving your autofocus on is also a great default option. If you go this route, rather than setting a focus point, I’d suggest setting your camera’s focus mode to general area autofocus, as many points as your camera allows. Today’s cameras are really good at AF (auto focus). As I’ve already mentioned, I like the 35mm equivalent lens. I also shoot 50mm as well as 24mm to 28mm and even as long at 90mm (although much rarer). For me generally speaking, using a wide angle lens with street photography helps to get in close, incorporate context and depth. Especially shooting from the hip. A wider field of view also increases the likelihood of getting your subject fully or properly in the frame when shooting from the hip, leaving you sufficient room to crop as needed after the fact. When you are shooting from the hip, it is easier to grip the camera from the lens. It is amazing how much this will change your style, how you see and how you feel the camera. When you hold the camera from the lens rather than body it becomes an extension of your arm. This technique is likely to increase your framing accuracy as you point the lens towards your desired subject or scene. These are just some strategies and thoughts on shooting from the hip. I’m betting there are others out there who have more suggestions. What do you think? Do you shoot from the hip? 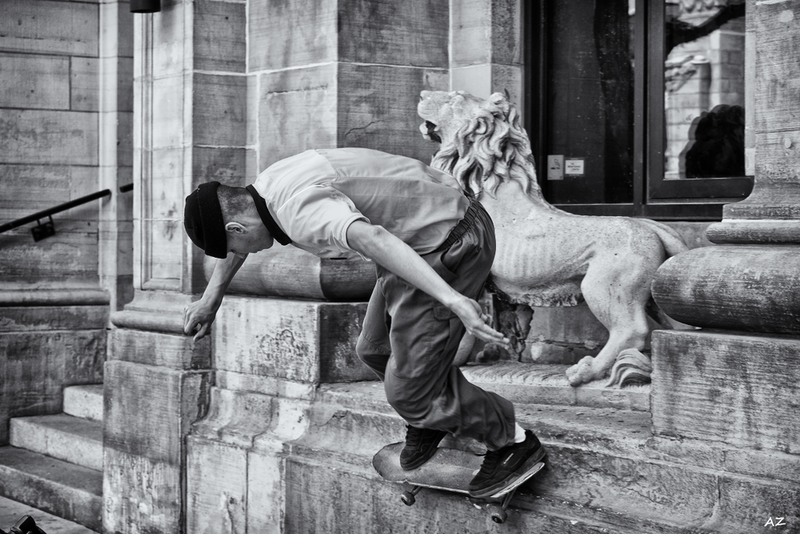 What inspires your street photography? Where do you find your ideas?